I couldn’t wait for Friday to share this amazing recipe. I’ve been tinkering with this chocolate chip shortbread for a long time now and it is finally perfect. I first tried my hand at shortbread for Thanksgiving 2013 and I was encouraged by the initial results. Since then I’ve made some tweaks here and there to come up with a recipe that I absolutely love. The biggest change was using powdered sugar instead of granulated sugar. I shared my first attempt (Chocolate Chip Cookies #41) back with that ingredient swap back in February when I baked desserts for a Super Bowl party. The powdered sugar gave the shortbread cookies an amazing crumbly texture, but I didn’t think they were quite sweet enough with only 3/4 cup. Luckily folks still seemed to like them. However, I thought there was room for improvement. After doing some research about substituting different kinds of sugars in recipes I decided to double the amount of powdered sugar (1 1/2 cups) and see how that worked. Well, the flavor of the resulting cookies was incredible! They were buttery and just as sweet as I wanted them to be, but unfortunately the lovely shortbread texture was missing. So today made another batch with 1 1/4 cups of powered sugar and it’s perfect! I’m so glad I stuck with this recipe until I got it right. Go and make a batch and see for yourself how great these cookies are! In a large bowl, cream together the butter and sugar. (Measure the powdered sugar like flour, loosely spooning it into a measuring cup and leveling the top with a knife.) Since powdered sugar has a tendency to clump (and I don’t own a sifter), I usually use an electric mixer for this recipe. Add the vanilla and salt and beat until combined. Add the flour and beat until almost completed incorporated, scraping down the side of the bowl with a rubber spatula as needed. Fold in the mini chocolate chips. Spread the dough into an 11×7″ pan lined with aluminum foil and coated with cooking spray. Bake at 375 deg F for about 25 min (check after 20 min just in case), or until a toothpick inserted in the center comes out clean and the top is starting to turn golden brown. Cool on a wire rack for 10-15 min and then lift the cookies out of the pan with the sides of the aluminum foil. 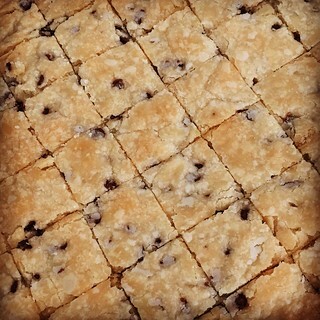 Slice into squares before the they cool (it’s easier while the cookies are warm). Cool completely before eating. Enjoy! Based on Kirbie’s Cravings’ Chocolate Chip Shortbread Cookies and Add A Pinch’s Shortbread Cookies.